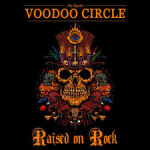 Share the post "Album review: VOODOO CIRCLE – Raised On Rock"
Inspired by the likes of Rainbow and Deep Purple, Germany’s Voodoo Circle have been delivering melodic hard rock for a decade now. Recently, Voodoo Circle underwent a metamorphosis that both of those aforementioned bands have had considerable experience of, namely a change in vocalist. Virtuoso guitar combined with accessible melodies and unforgettable hooks is, as Ritchie Blackmore discovered long ago, an irresistible combination and there’s some good song-writing and quality musicianship on this album. ‘Running Away From Love’ deploys all of those tricks and opens the album in style. ‘Where Is The World We Love’ and ‘Chase Me Away’ show a slower, more reflective side of the band but, again, strong melodies, memorable choruses and passionate, soulful guitar solos leave their mark on the listener. The Blackmore-esque epic ‘Dreamchaser’ dates back to the earliest days of the band. Originally written for Voodoo Circle’s debut album Beyrodt wasn’t quite happy with the result but, finally, it takes its place on this album. “The arrangement of the number was changed and overhauled repeatedly over the years, now it’s matured to the point where it was ready for recording,” says Beyrodt. This entry was posted in ALBUM REVIEWS, ALBUM REVIEWS (Mobile), All Posts and tagged AFM Records, album, Alex Beyrodt, hard rock, melodic, Rainbow, Raised On Rock, review, rock, VOODOO CIRCLE. Bookmark the permalink.